Our yacht harbour is close to the center of the city at the Danish border, and also near a diverse mix of gastronomy and shopping facilities. From your mooring place, you can see straight to the historical sailing boats in Flensburg’s museum harbour. You can either discover the city with its mix of two languages and cultures, or simply enjoy a relaxing stop on your journey to the Danish Southern Seas or the Schlei. 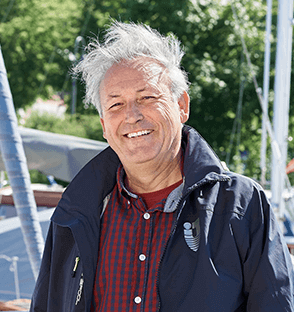 168 mooring places at a modern wooden bridge with an inclusive electricity and water supply make our harbour in Flensburg an ideal point for permanent guests to start cruises in an exciting and diverse sailing area. We look forward welcoming you to your visit between sky and fjord! You can find an overview of all prices for moorings in our yacht harbour here. Our prices include the legal taxes, all changes remain reserved. Binding prices are received in response to booking requests. Flensburg - a city that seems to open a gate to the whole world. Not only has it been influenced by its 700-year history as a rum and merchant city, but also by its vicinity to the Danish border. Since Flensburg overcame the Second World War with almost no damage, the historical city center has remained intact. One landmark you definitely shouldn’t miss is the gateway “Nordertor” which was built in 1595 and remains a symbol of the city to this day. The Maritime Museum should not be missed either. It is located in an old customs building near the harbour and is home to a huge collection of replicated ship models. And Flensburg’s very own Rum Museum is also definitely worth your time. Of course, a busy program isn’t necessary to have a good time. You can also simply let yourself drift through Flensburg’s alleys and historical merchant’s squares or enjoy the main street while shopping in one of the 500 stores. Anybody looking for a special souvenir will be sure to be rewarded in one of the many unique boutiques and independent shops. In our home port Flensburg you can moor with a view to the museum harbour between "Sky and Fjord".